The adoption of digital technologies in agriculture has been increasing at a rapid pace. In fact, the adoption of digital technologies in every industry has been increasing. The reason why this is such a prevalent trend is that digital technologies bring tremendous value to businesses and individuals. In the agricultural industry, there are many digital technologies that fall under the category of “precision agriculture”. Precision agriculture technologies are changing the way that farmers manage their crops and is being adopted at a growing rate. Precision agriculture is a data-driven methodology for managing and optimizing the production of crops. In recent years, agricultural producers have been adopting precision agriculture technologies for a handful of reasons. A recent study that was conducted at the University of Nebraska-Lincoln, which is focused on precision agriculture technology adoption, reflects this trend. In this study, a survey was given to agricultural producers at various Nebraska Extension events throughout the year of 2015. Therefore, the survey participants are likely to be Nebraska based farmers. There was a total of 126 responses of farmers whose farms were an average of 1,247 acres of row crops out of a total average operation of 1,507 acres. The figure below shows the different types of precision farming technologies and the rate at which they are adopted. 1. The highest adoption was soil sampling (98%) and computer w/ internet (94%). Yes, you need a computer with internet to use latest digital technologies in agriculture. 2. Yield monitors and maps, and GPS guidance systems had more than 80% adoption rates. 3. Variable rate technology was also very common at a 68% adoption rate. 4. Satellite and aerial imagery are on the way to be widely adopted by farmers. Overall, the adoption of precision agriculture technology is fairly high. 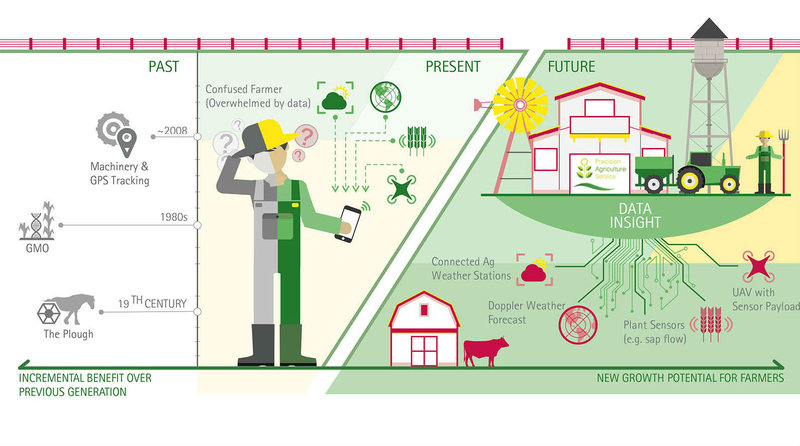 Some of these technologies, like internet or tablets, are not necessarily used solely in precision agriculture, but they are the foundational technologies that allow for further adoption. Another report, which was published by Goldman Sachs, highlights the significant increase in expected yields based on the technological improvements being introduced by precision agriculture. Their report estimates that these new technologies with allow for 70% higher yields on the existing agricultural land. This translates into a total addressable market of $240 billion by 2050. The below figure shows how different technologies will influence the global crop value in the US. From this report, it is clear that these technologies will have a significant impact on the agricultural industry. The technology solutions that are offered and will be offered in the future increase the value of land by making it possible to produce significantly more crops per acre. The above figure from the Roland Berger report reflects the estimated market for precision farming technologies. We can see that the US and European markets are the most attractive. Even though the estimation supports this statement, the developing world will also see some major growth in precision agriculture because of the current lower cost. This figure is another key indicator that the adoption of these solutions will only increase due to the value that they are bringing to farmers. – Efficiency in use of resources like chemicals, fertilizers, water, fuel, etc. These benefits add a tremendous amount of value to the production process, due to the increased yields that are a direct result of the integration of this technology. The added value can be determined by analyzing the estimated increase in yield, and in the same Goldman Sachs’ report, they calculated the added value in dollars based on each of the main forms of precision agriculture technology. The results are below. 1. Precision Fertilizer — $65 billion TAM (total addressable market) with $200 billion in added value based on an 18% yield increase. 2. Precision Planting — $45 billion TAM with $145 billion in added value based on a 13% yield increase. 3. Compaction Reduction via Smaller Tractors — $45 billion TAM with $145 billion in added value based on a 13% yield increase. 4. Precision Irrigation — $35 billion TAM with $115 billion in added value based on a 10% yield increase. 5. Field Monitoring, Data Management, etc. — $35 billion TAM with potential $125 billion in added value. 6. Precision Spraying — $15 billion TAM with $50 billion in added value based on a 4% yield increase. We briefly covered some of the different forms of technologies that are used in precision farming, but let’s look at the main technologies in detail. 1. Crop Health Monitoring (mostly based on NDVI) — Normalized Difference Vegetation Index (NDVI) is a method that is used to determine the health of crops through the analysis of drone and satellite imagery. It looks at various wavelengths of light, both visible and nonvisible, to make these calculations. This technology can allow you to assess the general health of your crops and detect crop variability. 2. Crop Scouting — This precision agriculture technology also makes use of NDVI, but it is also being facilitated through tablets and mobile phones. Scouters go out in their fields with a tablet and collect important data about their crops. There are some platforms that analyze and make meaning out of this data. This helps farmers monitor pest populations and weed activity on their land, and allows farmers to increase yields and make more money. 3. Yield Monitoring and Forecasting — The yield information can be collected either from satellite imagery and drones or from the sensors installed on the farmer’s machinery. These yield sensors can be attached to harvesters or tractors and collect information on things like grain yield, moisture levels, and more, which allows farmers to make better decisions on when to harvest, plan next season and fertilization, analyze field variability, and many other things. 4. 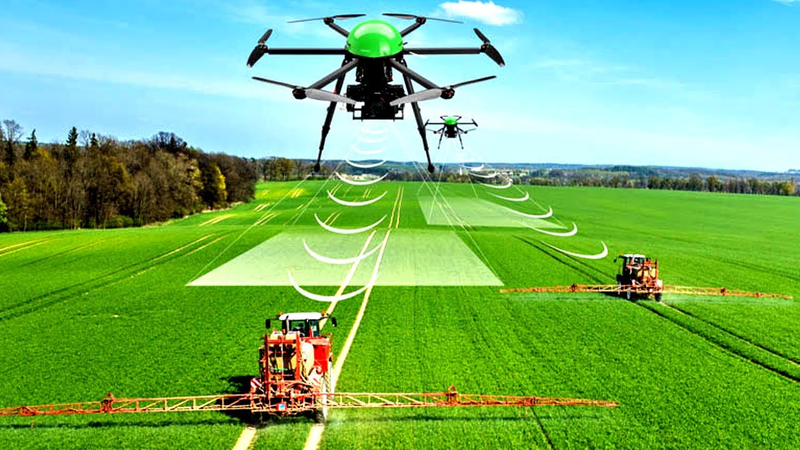 Detection of Diseases, Pests, or Weeds — As you can see, drones have many uses in precision agriculture, and the detection of diseases, pests, and weeds are yet another value that comes from drones and hyperspectral imaging. Gamaya’s hyperspectral camera is the smallest, most lightweight commercial hyperspectral camera that is currently available, and this makes it perfect to attach to drones and nanosatellites. Gamaya’s camera is tightly integrated with proprietary software to translate raw data into actionable information for farmers. 5. Weather, Irrigation, and Soil Quality — Ground-based and plant sensors are used to collect information about the soil and water. For soil, some of the things these sensors measure are texture, organic matter, salinity levels, and nutrient status. Weather stations are used to gather the appropriate weather data, which allows farmers to see how different weather patterns may affect their water and soil. There are many different technologies for irrigation, but one very useful one is called drip irrigation, which allows farmers to irrigate their land by the use of pumps and valves that can be manually or automatically controlled. 1. Farm Management Software Platforms — Farm management software platforms are just what they sound like — platforms that help farmers manage their crop production. These platforms (i.e. Granular) integrate with the different hardware devices that are used in precision agriculture. The data from these devices are aggregated onto the central platform where they can be processed and analyzed to help farmers make better decisions on how to manage their operations. 2. Data Platforms — Outside of farm management solutions, there are data platforms like Field View from Climate Corporation and Farmers Business Network, whose focus is more on data aggregation so that they can provide data to farmers as a resource. They also want to give farmers a central location where a multitude of information sources come together to provide an overall picture of the industry. Variable rate application in precision agriculture focuses on the automated application of materials like herbicides, chemicals, and seeds to a landscape. These materials are applied in an automated fashion, which is based on data that is collected by sensors, maps, and GPS. This process involves different forms of precision agriculture technologies like multispectral and hyperspectral cameras, satellite imagery, and application machinery on tractors. VRA is one of the main features of precision agriculture, that allows optimizing use of chemicals, fertilizers and other resources. 1. Farm Robots — Robots are used in many industries to automate different tasks. In farming, robots are used for a handful of reasons, but one big use is the automation of weed management. Blue River Technology and Ecorobotix are two companies that have developed robots that use cameras to identify weeds in real time and will make decisions on how they should deal with them. 2. Guidance Systems Based on GPS — Just as it sounds, GPS technology is used to guide automated machinery and vehicles in things like auto steering, high navigation and positioning, and more. 3. Telematics — This involves machine-to-machine communication between the hardware and sensors that are involved in automation. For example, when a camera identifies a weed, it needs to communicate this information to another piece of machinery that can pluck the weed out of the ground or spray it with some herbicide. Telematics is crucial in automation. 4. Precision Planting — Precision planting is an automated approach to optimizing the planting of seeds. It allows for better seed spacing, better depth control, and better root systems. There are many pieces of information that are used to make the proper analysis in identifying the optimal conditions for planting, and this is all easily collectible with the various forms of precision agriculture technology on the market. The future of farming is very bright. There are more and more precision agriculture technologies coming out every month. All of these solutions offer substantial value for farmers in their effort to optimize production, better manage their operations, and both save money and make money off bigger yields. These technologies are being adopted by farmers at an accelerating pace. The Roland Berger and Goldman Sachs reports show how both the market size and the adoption are at all time highs, showing no signs of slowing down. From field monitoring technologies to variable rate application, the available precision agriculture technologies offer an end-to-end solution for today’s farmers.